I took a break after years of being a stylist, a costume designer in Colombia, the creator of a successful label, and the editor of my own online fashion magazine in the US. I needed time to think about my priorities. The conclusion of that reflection was that I needed to express my creative intent and social responsibility through giving new life to items that previously had one. And that is what I do now. Why do I say that Claudia reinvented herself? Because she did! She had quite a successful fashion label with four boutiques in Colombia and, also exported to other countries. Claudia and her family moved to the US a while ago, and she started a successful online fashion magazine, that consumed most of her time, so she decided to quit and, have more time for herself and family. As a professional woman who worked all her life, she couldn’t simply stay at home and do nothing. That is why she started a new sustainable fashion line, made from garments found at consignment and second-hand thrift shops. She designs on paper how each piece of clothing has to be and then sends them to Colombia where single mom artisans from underserved communities, embroider and sew all the pieces Claudia carefully placed with pins. Don’t you love this upcycled camo jacket beautifully embellished with feathers? I was really moved by the fact that you see a label that tells you the name of the Colombian artisan who embroidered the clothing piece you’re buying. Because, you can imagine that single mom whose hands contributed to making you look great, and received a fair payment from Claudia. That Elisa, or Ana or Elena, can have a better and fulfilled life and, also raise her children well. 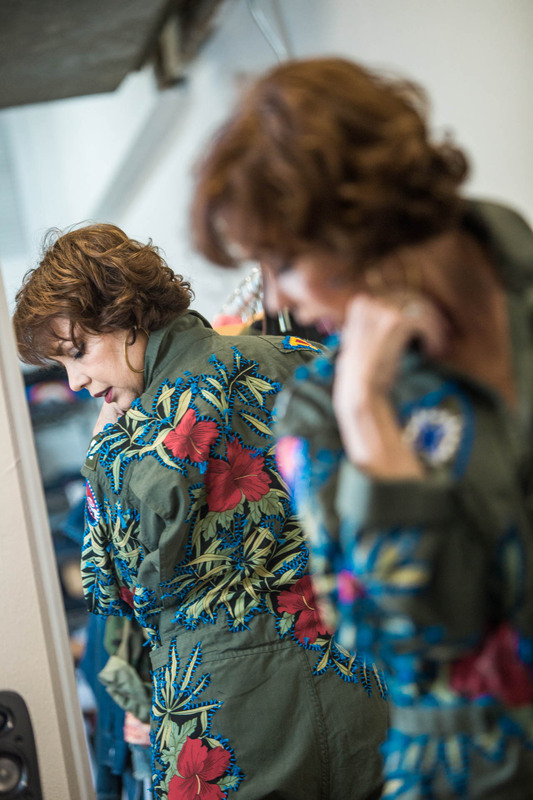 Don’t you think it is rewarding to know that the jacket or jumpsuit or t-shirt you buy from Claudia is contributing to open new horizons to people who otherwise wouldn’t have the opportunities they have? Thanks to sustainable initiatives such as Claudia’s, young Colombians have a future. I love the fact, that in each of Claudia’s garment there’s an empowering message because we women have been neglected for too much time. We need to be aware of how strong and powerful we are, how precious what we do is, and, there’s no limit to achieving what we want. Claudia is a great example of how the wisdom and experience that comes with age, can be a fantastic fuel to reinvent ourselves at any age and do it with style. We both were born in the same year and, the same month, with only 4 days of difference, in 1958. We’re both Sagittarians, her birthday is on December 8th and mine is the 12th. She’s from Barranquilla, Colombia, and I’m from Caracas, Venezuela, two neighbor countries with many things in common. We both live in Miami and, when we go to fashion pop-ups or events, we never see other midlife bloggers or Instagramers, so we were both grateful to met each other. I enjoyed every minute of this photo shoot because we were able to talk and started a new friendship. A week later, I paid another visit to Claudia’s studio with another great midlife woman and Miami Lifestyle Blogger, Karen Escalera, who is also a Sagittarian and we had a great afternoon together. Did you like the story? Do you embrace the Upcycling movement? Actually, I do, you can read about it in this previous post. Let me know! Your opinions are so important to me to improve my blog. Previous Post Wake up with no puffiness in you eye area!